The Magh Bihu celebration on 14th and 15th January 2016 was a stupendous success, there was a huge gathering at Wafra Farm house. 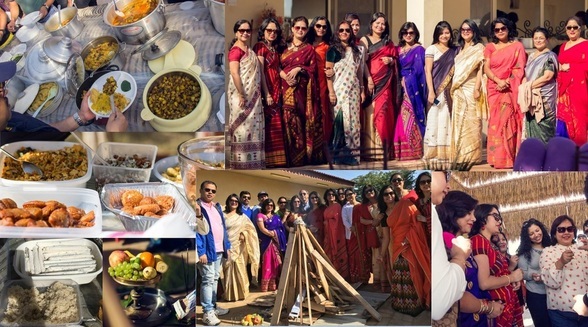 Uduka was celebrated on 14th night in the farm house which was fun-filled with bonfire, live music and bhoojbhat. Next day on the day of Bihu,, the multi-cuisines Jalpaan was solid hit and everyone relished it to the fullest. All the members has enthusiastically contributed with one or the other item, each one was indeed perfect like we find in Asom. Its really worth praising the ladies of AAK for putting so much effort and serving us with variety of Pitha-Pana, laaru, Jalpaan, which is very difficult to get here (specially the ingredients). The children and ladies had a Gala time enjoying various Fun-n-Games program The best part of the day was the mouth-watering menu of Bhoj-Bhaat. You can find here few fun-filled memories of the event captured during both the day. AAK would like to THANK to all members for their contribution towards AASHA for a humanitarian activity for the people of Assam. AASHA has recently carried out a flood relief activity in Tinsukia District of Assam. Mr. Sasanka Bhuyan, a new member of AAK provided his time & efforts to make our mission successful. Please click here to watch the video. 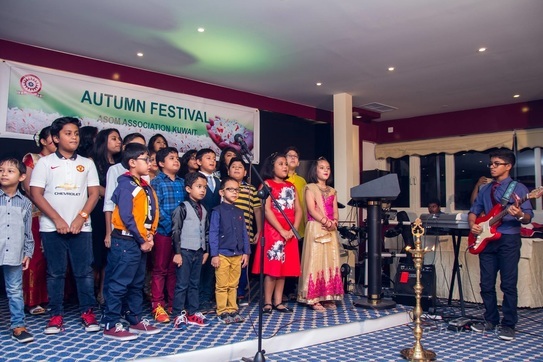 ﻿﻿AAK celebrated ﻿﻿Autumn Festival on November 6th 2015 at Banquet hall of Samrat Restaurant in Salmiya. It was a big success with active participation of all junior members of AAK. Please click here to visit the image gallery of the event. The AAK Executive Committee members had a meeting with the Honourable Ambassador of India to Kuwait, Shri Sunil Jain, on 2nd December 2015. 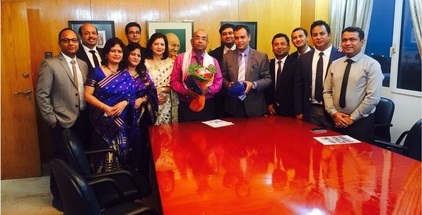 The AAK President Shri Bijan Goswami and the team appraised him of the activities and achievements of our association and offered our best wishes to him. The honourable Ambassador expressed his appreciation and conveyed his wishes to the AAK community. Click here to find details of EC 2015 Members. 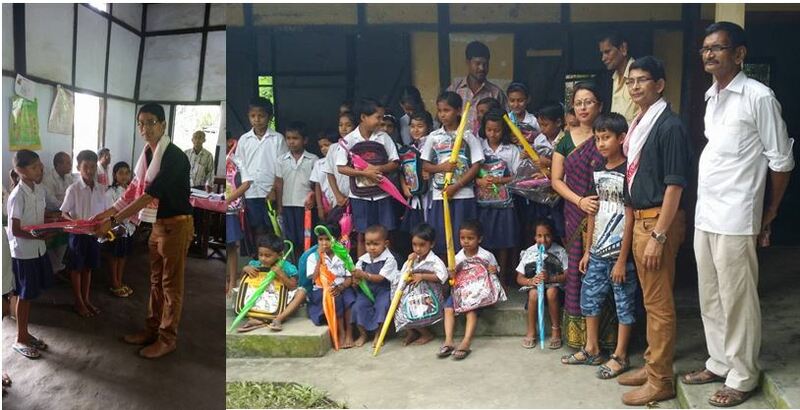 AASHA has donated few necessary office items to No.1 Halogaon Tripara L.P School and also distributed school bags and umbrella among all the students. With overwhelming support from our AAK members, AASHA project “AID to FLOOD VICTIM” has become a big success. AASHA has sent relief materials through the deputy commissioner of Goalpara district Mr. Preetom Saikia and Mr. Saikia helped us to distribute the relief materials in Bolbola area without any problem. Although it was planned to send our aid through "Kalaguru Artiste Foundation”, finally procurement and the distribution of the materials were organized by Mr. Bikash Tamuly. The materials were distributed in four flood affected villages in Bolbola area which covered about 490 flood affected families. Members are requested to collect their contribution receipt from AAK treasurer and please continue your support to AASHA. Please find here the appreciation letter from Deputy Commissioner of Goalpara district. on behalf of the new Executive Committee, I would like to take this opportunity to thank all the AAK Members and the outgoing Executive Committee for nominating and choosing the new Executive Committee of AAK under the energetic leadership of Mr. Bijan Goswami..please﻿ ﻿click here﻿﻿ for the complete message. The latest version of the constitution is available for viewing and downloads. 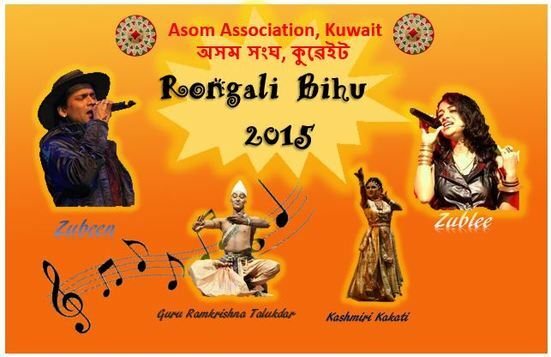 AASHA is a charitable trust under Asom Association, Kuwait (AAK). This is an attempt to support our brothers and sisters in our homeland. AASHA will try to support needy people through difficult times. Fund will be generated on the basis of voluntary DONATIONS and members can VOLUNTEER any number of donations in a year. Minimum limit for such donation on each occasion is KD10. AASHA is in budding state and needs your support to grow further. AASHA is trying to find out the best credible organization for our charity efforts. All members are welcome to suggest organizations to which the donations can be made. AASHA’s first attempt, collection of FIT-4-PURPOSE used items was successful and thanks to each and every members for their support. We have sent about 500 kg of used items from Kuwait to a NGO name “ABAKASH MAJULI”. We request you to come up with new ideas and suggestions to help us. We are eagerly looking forward for your commitment. CONTACT US for AASHA by clicking here. Ministry of External Affairs has decided to phase out the Non-Machine Readable Passports (Non-MRP). A Public Notice in this regards is attached. Please Click Here for GOI circular. This Google search is customized for searching through leading English Dailies of Assam.